War in HD the Complete Collection DVD Review It’s an artful, thoughtfully-presented and painstakingly researched collection, and those with an interest in US involvement in conflicts such as WWII and Vietnam will find it indispensable. Though I’m not sure its claim to being ‘the first documentary to show original colour footage of the conflict in immersive HD’ is entirely accurate, the 10-episode 2009 series WWII in HD is a paragon of documentary excellence that presents dramatic and at times definitive colour footage of the bloodiest conflict in human history. Taking a strong American bias and focusing heavily on the Pacific theatre, the series tells the story of US involvement in the war through the eyes of 12 American service members, several of whom were interviewed anew for the series and one of whom, Austrian immigrant Jack Werner, died shortly after its premiere. The end result is a personal, detailed and immersive look at life on the front lines, and of what came after for these 12 brave men and women. My only complaint would be that the European conflict is glossed over at times in favour of stories from the home front, of American involvement in the Pacific, North Africa, the Japanese islands and so on, but I guess you can’t begrudge the Yanks for wanting to celebrate their mythology and there isn’t exactly a dearth of decent docos on Hitler and the Third Reich. In any case the narrative (spoken by Gary Sinise) is a comprehensive and compelling one, and the footage is, as stated, dramatic and well-chosen. 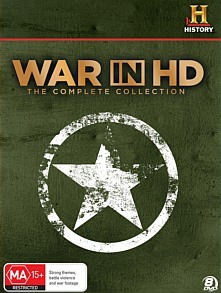 In addition to this epic 10-parter, the War in HD box set also features the bonus documentaries WWII in HD: The Air War and WWII in HD: The Battle for Iwo Jima, as well as the highly regarded six-episode series Vietnam in HD and a slew of bonus material, including Character Profiles and featurettes on the sourcing and preservation of the footage utilised throughout. It’s an artful, thoughtfully-presented and painstakingly researched collection, and those with an interest in US involvement in conflicts such as WWII and Vietnam will find it indispensable.